Here are some mouth-watering Tex Mex recipes — so tasty that your family and guests will think you just graduated from a Mexican cooking school! Nobody needs to know that they are quick and easy to prepare. Here's an easy to prepare 3-course Mexican meal to get you started. First up is the appetizer. Guacamole is the traditional Mexican avocado dip - it's amazing that a dish so simple to prepare can taste so heavenly. The main course is a choice of two Tex Mex favorites - home-style beef enchiladas or authentic Mexican chorizo. Vegetarians can substitute Cheddar Jack cheese enchiladas for the beef enchiladas or the chorizo. A delicious spicy enchilada sauce recipe that complements both cheese and beef enchiladas is given as well. Celebrate the traditional Mexican holiday with authentic Menudo Sonora, Chile con Queso, and more classic Mexican food recipes. You really can prepare special treats that taste delicious and are good for you. These dessert recipes are tasty and healthy. All are no fat or low-fat recipes, but you wouldn't know it if you hadn't made them yourself. There is a great deal of conflicting information these days on whether a low fat diet or a low carb diet is healthier in general. Mexican food tastes best with authentic Mexican cheeses. Learn what makes these Mexican cheeses special and get recipes that bring out the best of Panela, Queso Fresco, Cotija, Crema Agria, and much more. Try using some Chile Peppers in your cooking! Peppers, together with other seasonings, give Mexican food recipes their spicy flavor, but they are not all hot. You're familiar with bell peppers. Did you know that poblano and ancho are relatively mild as well? Come on ... put a little pep into those Mexican food recipes. 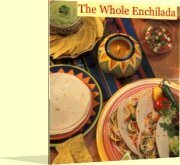 Want to learn more cooking techniques & Mexican food recipes - delivered monthly to your inbox? Copyright © 2004 - 2005 Strong Commitment LLC. All rights reserved.